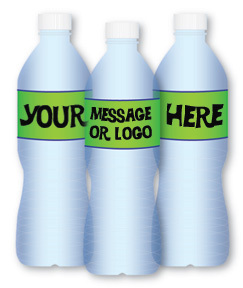 Impress your friends or show your clients your appreciation by offering them an ice cold bottle of water - with your message, logo or party theme. We take locally purchased bottles of water and label it for you with a custom designed message, printed on waterproof polyester labels. Or save money and apply our labels yourself. Quanities as little as a case can be ordered for a small party or open house PLUS there is no need to purchase and store large quanities to get a great price! See our stock designs that can be customized for you, or upload your logo and idea and we'll design your label. and fun. Get started TODAY !